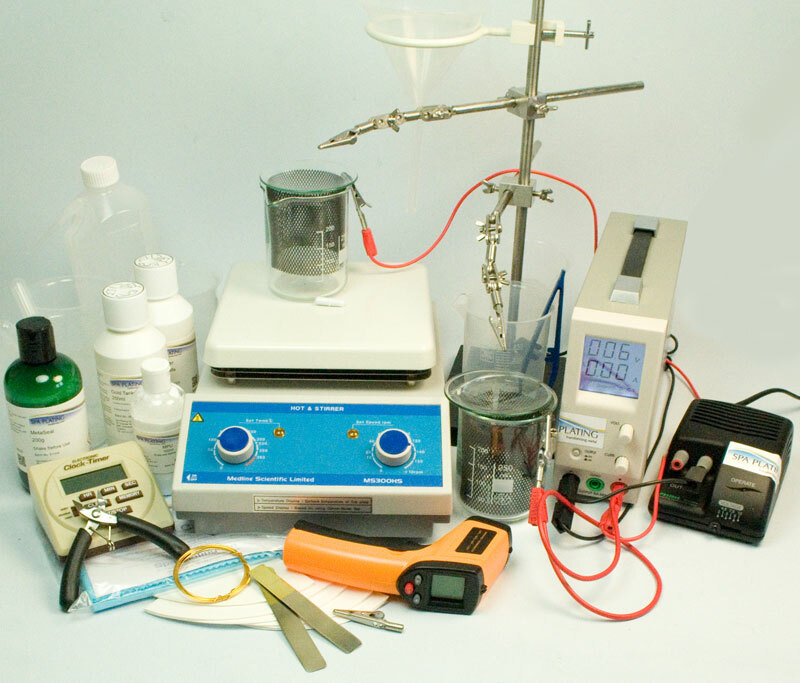 Our Gold Tank Plating Kit, when used with our on-line Gold Tank Plating Calculator, means you’re now in complete control of the gold plating process. Plating to vermeil standard requires a layer of gold of at least 2.5 microns on sterling silver and our kit will help you plate to these kinds of specific and substantial thicknesses of gold. You’ll not only be confident that the layer of gold you’ve plated is of a uniform thickness, you’ll also know how much gold is left in your remaining plating solution and therefore how long it will take to plate your next item to the same or a different specification. Our kit also offers you the flexibility of plating larger objects in our 500ml, 1 and 2 litre capacity Plating Beakers. Set up your Gold Tank Plating Kit as shown. To set up your equipment, please see our guide on rhodium tank plating for the instructions to do this. 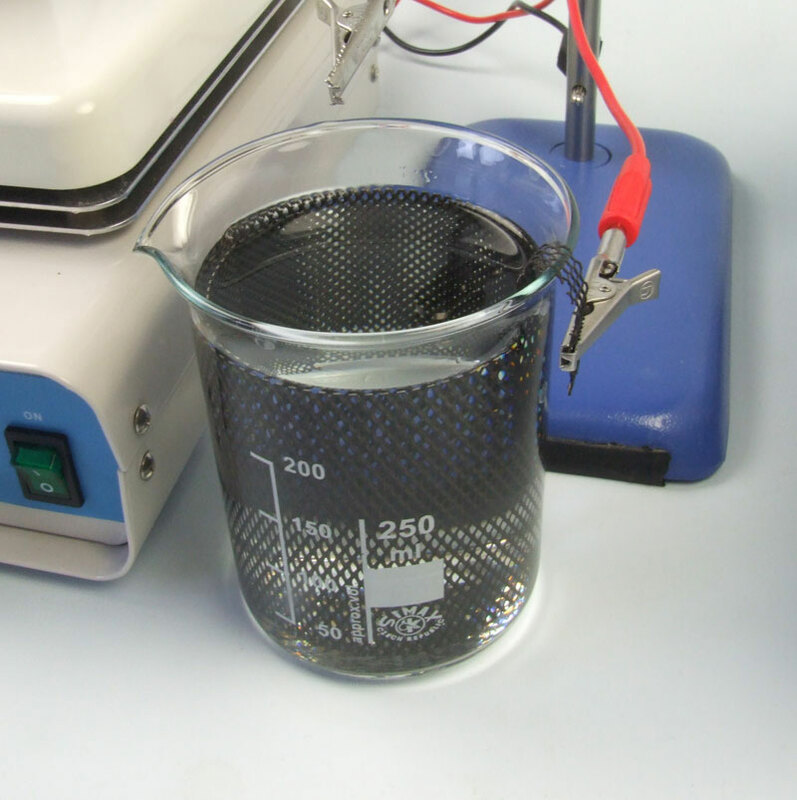 Once the plating beaker is filled with gold solution and is on the hot plate stirrer, grip one of the red leads to its mesh electrode. 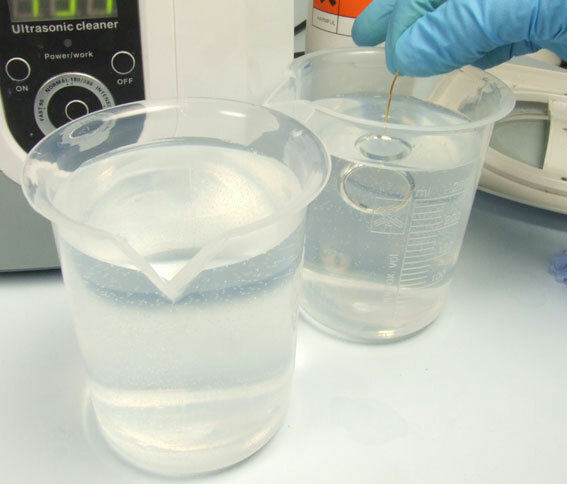 Turn on the hot plate stirrer and place the magnetic stirrer bar in the gold plating solution. Set the hot plate stirrer bar speed to 1 and the heat setting to between 0 and 1. You are aiming to heat the gold plating solution to 25 to 30 degrees centigrade, so you will need to adjust these settings as you go, to maintain a constant temperature. 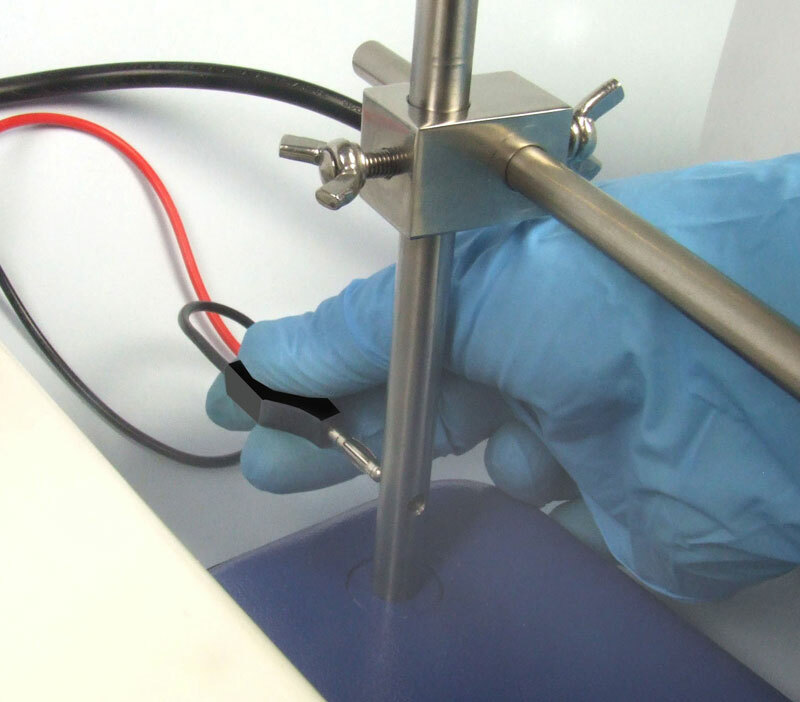 Check the temperature of the solution with the Temperature Probe. The other red lead should grip on to the mesh electrode in the cleaner beaker. The black lead should be plugged in to the base of the Plating Stand. The other ends of the red and black leads should be plugged in to the MF Rectifier. You’ll need to work out the surface area you’re plating and decide the thickness of plate you require. 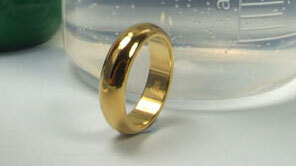 In this case we’ll be plating gold onto a sterling silver ring to vermeil standard. This means we’ll be plating to a gold thickness of 2.5 microns. The surface area of the example ring worked out at 8 square centimetres. 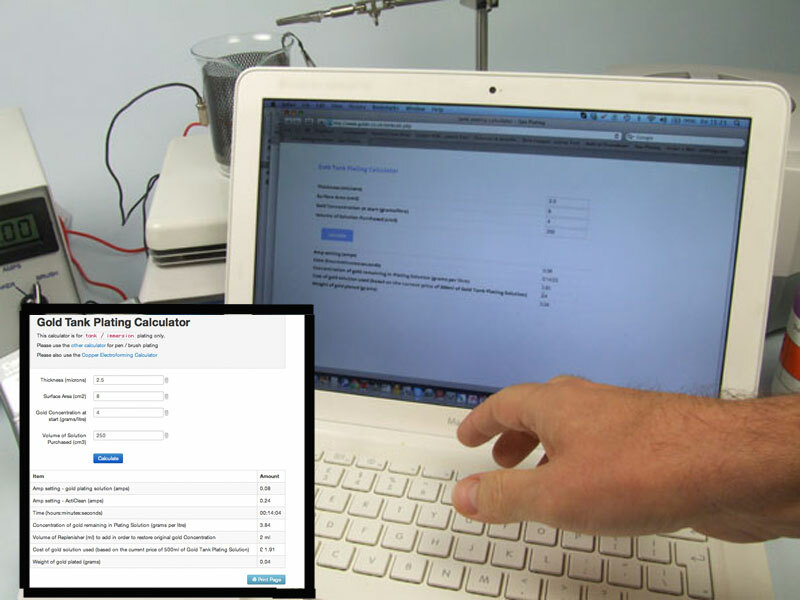 Go to the Gold Tank Plating Calculator on the Gold Tank Plating Kit shop page and enter in the required data. Press the ‘Calculate’ button and take a note of the results. 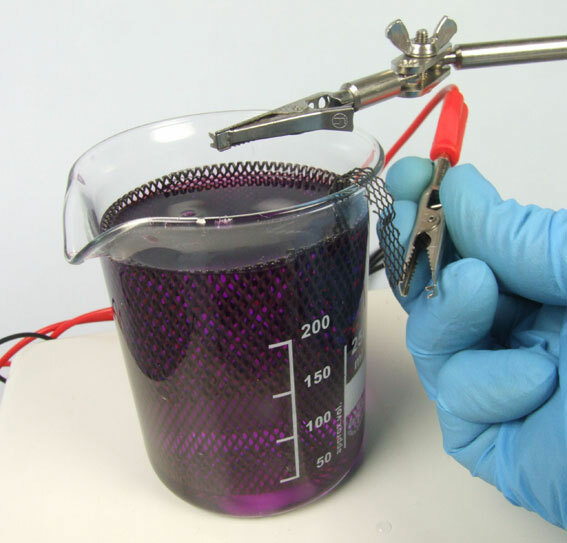 Based on the above data, the amp setting on the MF Rectifier for gold plating will be 0.08 for just over 22.09 minutes and for the powered cleaning stage it’ll be 3 times the gold amps at 0.8 Set your Plating Timer for the gold plating time. 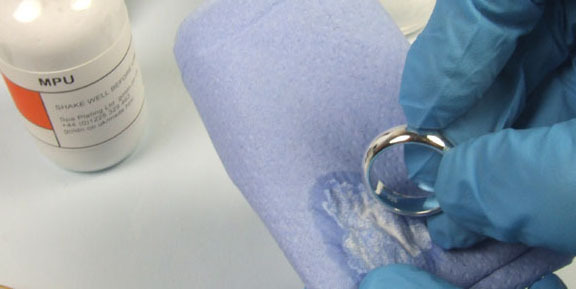 First clean the ring with MPU using a soft tissue. Then make a small jig to hold the ring, using the Gold Plated Jigging Wire and the Wire Cutters. 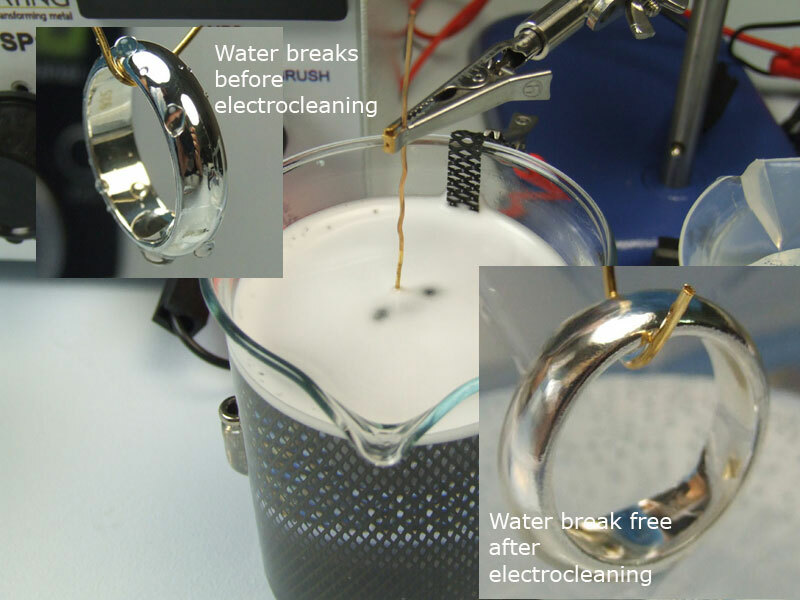 Hang the ring on its wire jig in the Ultrasonic Cleaner and turn it on – a couple of minutes should be enough. Leave the ring in the Cleaner for 2-5 minutes. Once it’s done, take the ring out of the Cleaner and pass it through rinse three and four of the six rinse stages. Grip the wire jig (with the ring hanging from it) in the crocodile clip that’s fixed to the arm of the plating stand. Make sure the Plating Timer is set to the right time (in this case 14.04 minutes) and start the timer as soon as you lower the ring into the plating solution. 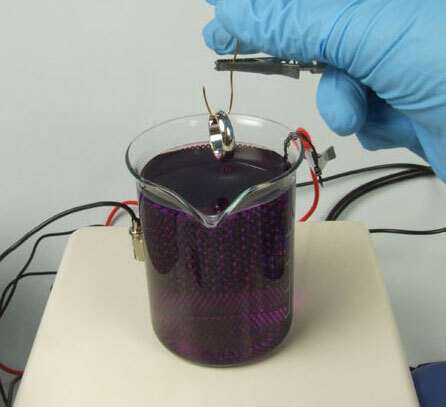 After the plating has finished, take the ring out of the plating solution and pass it through the two remaining rinses. We recommend that the last rinse should be deionised water. 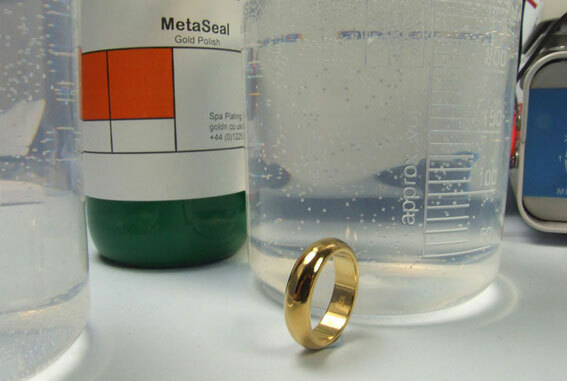 The gold plated ring can now be finished with MetaSeal to bring out the lustre of the plate and help seal its surface. 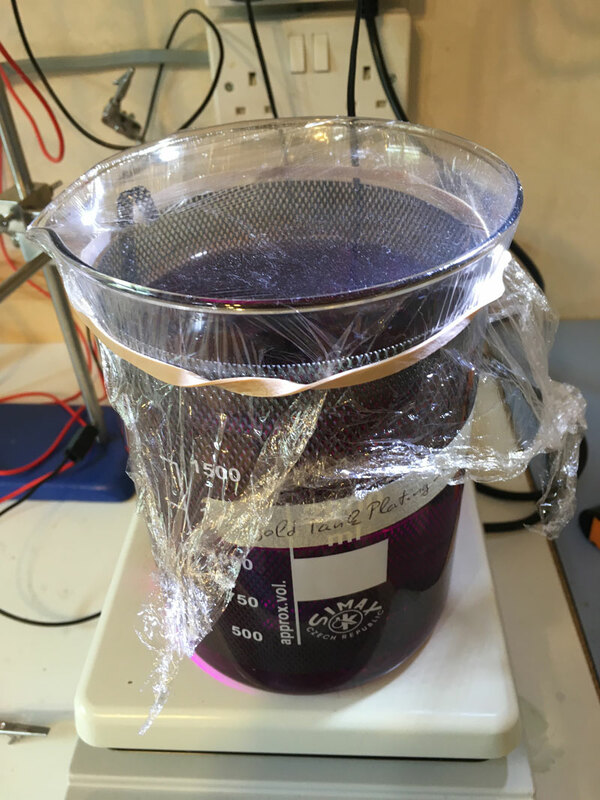 To maintan the plating solution in best working order, cover the beaker with cling film between uses. This will prevent dust and fine hairs getting in and reducing the eficiency of the solution. If you’re not going to be using the solution for more than three consequetive days it is best to re-bottle it. At some point it’s also a good idea to filter your solution. Guidance on this can be found on the filter kit product page HERE. I need to make platings with 3 to 5 microns on silver, is it possible? and what do I need. 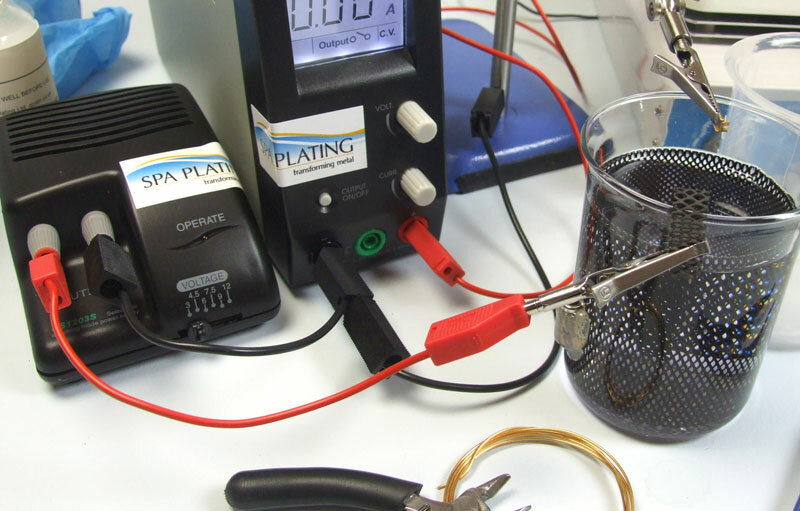 If you are plating gold on to silver, you will require one of our gold tank plating kits.